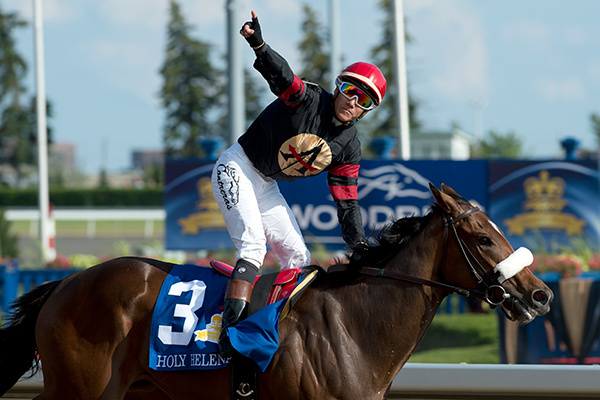 The return of Woodbine Oaks and Queen’s Plate champion Holy Helena will be another highlight for racing fans on Pattison Canadian International day this weekend. The Jimmy Jerkens-trained Ghostzapper filly headlines this Sunday’s $125,000 Ontario Derby (Grade 3) for three-year-olds, scheduled as the seventh race on the stellar stakes program to be run over 1-1/8 miles on the Tapeta. The Ontario Derby will mark Holy Helena’s third start on Canadian soil and put her in the running for year-end Horse of the Year honours. Holy Helena will be looking to rebound off an eighth-place finish in the Grade 1 Alabama in her last start on August 19 at Saratoga. Since then, Holy Helena has worked at Belmont Park multiple times and arrived at Woodbine for the Ontario Derby early enough to fit in another easy work over the Tapeta track on October 9. Jockey Luis Contreras rode Holy Helena in her prior Canadian starts and will be back aboard on Sunday. Cool Catomine, another Canadian Triple Crown leg winner, is also looking for a bounce back performance in the Ontario Derby. Following his 14-1 upset victory in the Prince of Wales at Fort Erie on July 25, the John Ross-trained Spring At Last colt ended up 10th in the Breeders’ Stakes last time out in his turf debut going 1-1/2 miles on August 20 at Woodbine. Ross believes that cutting back to 1-1/8 miles on the Woodbine main track in the Ontario Derby will benefit his contender. With Contreras set to ride Holy Helena, Gary Boulanger will pick up the mount on Cool Catomine for the Derby. Cool Catomine will start just outside of Holy Helena in post 10, a position Ross is happy with, referencing his trainee’s off-the-pace racing style. The field features another filly starting inside of those rivals from post two in the Mike Doyle-trained Grizzel, who is a Grade 3 stakes winner over Woodbine’s main track in the Selene this past May. More recently, the Irish-bred daughter of Kodiac has competed on the turf, finishing second in the Ontario Colleen (Grade 3) and fourth in the Canadian (Grade 2). David Moran retains the mount on Grizzel for owners Merriebelle Stable LLC and Anna Doyle. Other contenders include Queen’s Plate runner-up Tiz a Slam and Plate Trial winner Guy Caballero. Undulated and Colonel Samsen, who recently joined the meet’s leading Mark Casse stable and were each supplemented for $2,500, plus fellow Woodbine newcomers Senior Investment and Gorgeous Kitten complete the line-up.